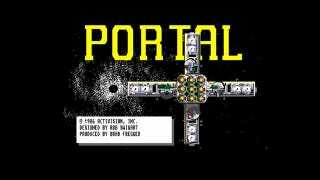 Portal may be the name for a contemporary series from Valve, about mad robots and jumpsuits, but it's also the name of a video game first released nearly thirty years ago. That game, Portal - Valve got the trademark after the original ceased using it - was a strange adventure title for personal computers, and was published by, of all companies, Activision. Portal's story is a great one: you're an astronaut who, after spending 100 years in space on a mission, returns to Earth to find everyone gone and the planet an overgrown wasteland. Picture Life After People, only in a text-based adventure game. Your goal, then, is to talk to a computer system called Homer, and by going back through its records try and piece together what happened. And that's it! No killing, no jumping, you were essentially digging your way backwards through a very depressing story. Think of it as Dear Esther 1986, if you will, complete with the very valid point that it was only half a game, the other half being some kind of interactive story. Indeed, so heavy on story was it that in 1988 it was re-released as just that, a novel. While that story is an interesting one, the game part left a little to be desired, your interaction with Homer being more than a little crude and obtuse. Still, it had its fans, and that coupled with the name's popularity coupled with the current Kickstarter madness has its original creator, sci-fi author Rob Swigart, hoping to get the cash together for a "proper" remake, this time as " a full-fledged computer game with modern technology, music, sound effects, art, voice acting, and gameplay".